Hundreds of people descended on Berkeley Saturday for a No Hate in the Bay rally. Anser Hassan reports. 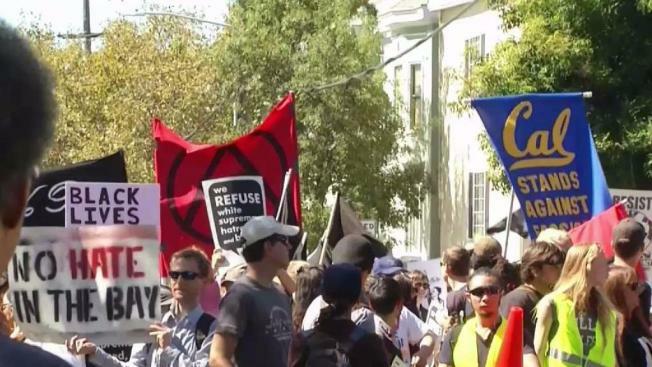 Hundreds of people descended on Berkeley Saturday for a "No Hate in the Bay" rally in response to the now cancelled Free Speech Week at UC Berkeley. Student group Berkeley Patriot called off the controversial Free Speech Week that many protesters said promotes hate speech and, by extension, violence, but right-wing provocateur Milo Yiannopoulos has vowed to show up anyway. Chants scattered across city streets on Saturday offered support for groups such as Black Lives Matter and those with LGBTQ affiliations. Signs hoisted into the air denounced those behind the so-called "alt-right" movement, calling them fascists and Nazis. Some of those signs read "Make Racists Afraid Again" and "Smash White Supremacy." "We are resisting the Free Speech Week at Berkeley that is claiming to be free speech, but we know that it's hate speech and that the people coming onto campus are violent," Linda Ereikat from the Arab Resource and Organizing Center said. Although Free Speech Week has been called off, Yiannopoulos and other speakers plan to gather at Sproul Plaza at 12 p.m. on Sunday, reportedly with the full backing of the Berkeley Police Department. Ereikat hopes that those who are able will gather in Berkeley on Sunday to speak out against Yiannopoulos. "We see that our communities right now are vulnerable and they are very scared and they're emotional," Ereikat said. "We need to fight back for them. The people that are really able need to fight back. We need to stand up." A common view for those in attendance at the Berkeley march was that those associated with the so-called "alt-right" movement encourage acts of hateful violence. Isaac Levszmonko with the Catalyst Project, which works on issues related to race relations, hopes the community will stand united against that behavior. "When Milo Yiannopoulos last came to campus, his goal there was to reveal the identities of undocumented students at Berkeley so that they would either be deported or be targeted for racist violence," Levszmonko said. "We think that's beyond the realm of free speech."